Open any list with the top most dangerous jobs and chances are you’ll find trucking somewhere in that list. It’s not that trucking within itself is a dangerous occupation. Essentially, it’s basic driving. However, the conditions under which a trucker drives is one that can be modestly described as ‘dangerous.’ This is due to several factors. For starters, the size of the vehicle alone means you’ll have to be extra careful. Additionally, the type of substance that is transported can range from least threatening to extremely hazardous. Overall, there are factors that we can’t normally control, such as weather and traffic. However, that doesn’t mean that you shouldn’t take an effective measure or be vigilant at all. A very integral tool in a trucker’s arsenal is their air horn. It’s a key feature of any horn and is certainly worth every investment. Why is an air horn important? The importance of air horn cannot be underestimated. Truckers routinely drive in conditions and scenarios where every driver has to ensure maximal safety of all on the road. On bigger roads, drivers are more likely to drive extremely fast and overtake frequently. To ensure that your trucking experience is safe, in case anyone tries to overtake suddenly, you’ll need a loud truck air horn. In contrast with smaller vehicles, trucks are generally more life-threatening if there is an accident. Hence, to alert all the drivers on the road, air horns are an absolute must to have. 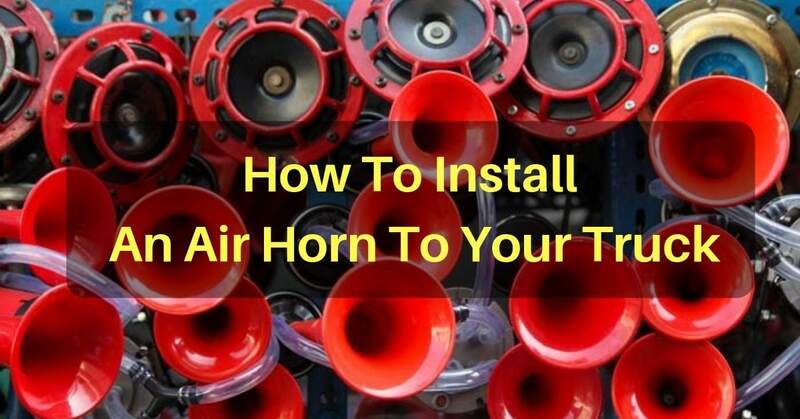 When installing an air horn, there are a few things you should keep in mind. These factors collectively combine to give you the most bang for your buck. Hence, it’s important to ensure that your requirements are efficiently fulfilled. The first and foremost factor is the sound, which needs to be loud and clear. The second factor you need to consider is air requirement, which trickles down to things such as tank capacity, work pressure, and compressor duty cycle. These two factors are essential when deciding an air horn for yourself. Based on requirements and needs, you can browse through different horns on the market. Installing an air horn might seem like a daunting step at first. However, if you follow the instructions below, you are unlikely to run into any difficulty. The first step you’ll have to do is find a good location for your air horn. Normally, truckers chose to install their air horn under the hood of the truck. Since sound is directed forwards to the vehicle upfront, it’s optimal to place it here. Furthermore, make sure the air horn is mounted in a tilted manner so that water does not accumulate in it. After choosing a good point, you’ll be physically mounting the air horn mechanism. The procedure is very simple, and every air horn box comes with a manual. The manual will guide you through the procedures you have to follow to mount the horn under the hood of your truck successfully. This step is not entirely mandatory. However, it is generally recommended by experienced truckers that you install the included compressor to the firewall or the fender. The next step is to connect the two apparatus. Using a tube, provided alongside, hook the compressor to the air horn. After doing so, ensure that it is secured tightly and well so that there are minimal chances of it coming off. Now that your horn is installed, it’s time to test it. The main reason for this is to ensure that your apparatus is installed well. Use the factory horn wire and test the air horn. When pressed, the meter should read about 12V. Additionally, the reading should be 0 when the horn is off. You’ll now have to connect the relay to the horn wire and hook the compressor up with 12 voltage power and ground. Now connect the compressor’s negative terminal to the ground. Now that all is set and done test your new horn. The air horn that you’ve just installed will ignite simultaneously with your truck’s horn, creating a greater sound effect.